Mallet finger, also known as baseball finger, involves a tear in the finger's extensor tendon, the tendon that allows the finger to straighten. A finger with this injury droops at its tip. Whenever a fingertip is jammed or forcefully bent down during any activity, the extensor tendon can tear. Because this injury is often caused by a direct blow to the finger from a ball or similar object, baseball and basketball players are especially susceptible. At times, during a mallet finger injury, a piece of bone is torn away with the tendon. This is known as an avulsion fracture. The symptoms of a mallet finger are normally quite obvious. Not only does the patient experience pain, swelling and bruising soon after injury, but the fingertip droops noticeably. Occasionally, blood accumulates beneath the nail or the nail becomes detached from the nail bed. While a mallet finger is typically easy to diagnose upon physical examination, in most situations, the doctor has X-rays taken to rule out other injuries, such as a bone fracture or joint misalignment. First-aid treatment for a mallet finger injury includes the application of ice to reduce swelling, the elevation of the finger above the level of the heart, and the administration of over-the-counter painkillers or anti-inflammatories. Prompt medical consultation is needed to rule out more serious damage, particularly if blood has collected under the nail or the nail has become detached from its bed since this may indicate the presence of a compound (open) fracture. Assuming the mallet finger does not involve a bone fracture, a splint is applied to keep the finger in full extension as it heals. The doctor will assess the damage and recommend the length of time the splint will need to be worn accordingly, usually between 4 and 8 weeks. At times, the doctor will recommend wearing the splint full-time for several weeks and then wearing it only during sleep. Although some patients may be tempted to wear the splint less frequently than advised, care should be taken to follow the doctor's directions to ensure that treatment is as effective as possible. This is especially important when the injury occurs in a child to avoid stunting or deformity as the child grows. In such cases, surgical hardware may be used in the repair in order to hold the bones in the proper position as they heal. In some cases, the joint may be fused, or the tendon may be repaired by stretching or through the use of tendon grafts. Rarely, patients who suffer this injury may develop an infection or other complication. The doctor should be consulted if pain worsens, skin color changes, numbness or tingling occurs, or the finger remains swollen after treatment has been completed. For most patients, wearing the splint is the only necessary treatment for a mallet finger. 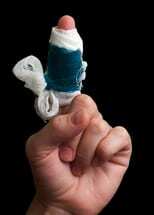 During the healing process, the splint may be removed for cleaning, but patients should take care to keep the finger straight while the splint is off. Patients are able to return to most normal activities during recovery, as long as the splint remains in place. Even with appropriate treatment and care, some patients may not regain full extension of the fingertip, but will have full, or almost full, finger function.